The trombone seems to be less favoured as a solo instrument than the saxophone, clarinet or trumpet, and yet, when it is featured and played well, it can be outstanding. 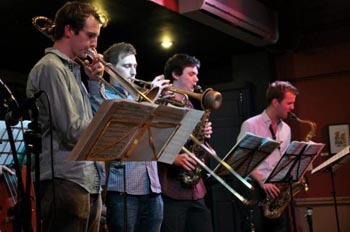 So it is with Tom Green who graduated from the Royal Academy of Music in 2013 with a first class MA degree in Jazz Trombone and Composition and almost immediately took his Septet on tour around the UK. Click here for a video of the Tom Green Septet playing Winter Halo at Dempseys in Cardiff during the tour. Tom Green was born in Cambridge in 1988. His mother is a cellist, his father plays clarinet, and both played with the University orchestras while they were students. When he was just four years old, Tom started playing the violin using the Suzuki Method. Explained by Wikipedia: ‘The Suzuki Method was conceived in the mid-20th century by Shin’ichi Suzuki, a Japanese violinist who desired to bring beauty to the lives of children in his country after the devastation of World War II. As a skilled violinist but a beginner at the German language who struggled to learn it, Suzuki noticed that children pick up their native language quickly, and even dialects adults consider "difficult" to learn are spoken with ease by people of 5 or 6 years. He reasoned that if children have the skill to acquire their native language, then they have the necessary ability to become proficient on a musical instrument. He pioneered the idea that pre-school age children could learn to play the violin if learning steps were small enough and if the instrument was scaled down to fit their body’. Tom’s classes involved ten to fifteen children of around the same age and placed a focus on aural training – rather than learning from notation. By the time he was seven, Tom had moved on to playing piano. He took lessons from Robin Steward in Cambridge and it was Robin’s interest in jazz that gave Tom his first taste of the music. ‘I only played basic jazz arrangements at that time,’ Tom explains. ‘I was just playing through notation, but I liked the sound’. What is surprising is that he came away with a Physics first when he spent so much time at university playing music. He was President and Musical Director of the Cambridge University Jazz Orchestra as well as being involved in other musical groups including the Cambridge University Musical Society Orchestras, President of the Queen’s College St Margaret Music Society and Musical Director of the Selwyn Jazz Band. ‘I played a huge amount of music in my final year at Cambridge,’ Tom says. ‘When the time came to leave, I had a physics degree, but I also thought that if I didn’t follow up on the music now ......... so I chose to apply to the Royal Academy of Music. 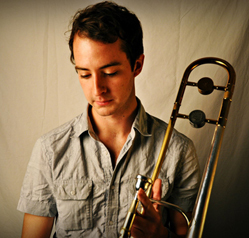 My parents were really supportive, and I was accepted by the Academy and started there in 2011.’ Tom was the first trombonist to be accepted on to the postgraduate course. During his first year at the Academy, Tom played concerts with various big bands including those of Gareth Lockrane, Jack Davies, the National Youth Jazz Orchestra and the Royal Academy of Music Big Band. He also played with various groups at Ronnie Scott’s Club, The Vortex, Pizza Express and the Bull’s Head in Barnes. In 2013, Tom was awarded the Dankworth Prize for Jazz Composition. Dame Cleo Laine has said of Tom’s work: "I’ve been involved in jazz for more than 60 years and this is some of the most exciting original new music I have heard for a long time. Tom’s writing has complexity, depth and intensity but above all a strong melodic thread ... played with fantastic energy and a true band sound" . In 2013, Tom also directed groups in Switzerland and Tunisia and recorded as part of the Troyk-estra big band at the Cheltenham Jazz Festival. Click here to listen to the Septet playing Tom’s composition Equilibrium recorded at the Royal Academy of Music in December 2012. Tom has received other commendations too. In the December 2013 / January 2014 edition of Jazzwise magazine people in the jazz ‘industry’ were asked who we should look out for in 2014. Tom Green’s name was put forward by three different people. ‘The Dixie Strollers are James Davison’s band,’ says Tom. ‘We played a lot last year – there seems to be a growing interest in this type of music, perhaps with movies like The Great Gatsby, and the enthusiasm there is for dancing, such as Lindy Hop. 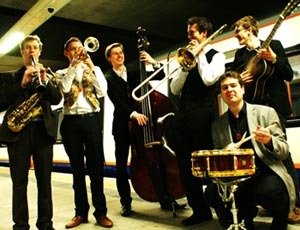 We played a number of summer festivals, wedding gigs and a special at the London Jazz Festival.’ The Dixie Strollers are a seven piece band in the Dixie / New Orleans style of the 1920s – 1950s with James Davison (trumpet), Sam Braysher (clarinet and saxophones), Tom Green (trombone), Sam Watts (piano), Will Arnold-Foster (guitar), Pete Hutchison (bass) and Scott Chapman (drums). Click here for their website. Click here for a video of the Dixie Strollers swinging Winter Wonderland at Powers Bar in Kilburn in December 2012. ‘Compass is an acoustic project fusing influences from global music with modern jazz ... the band takes influences from flamenco, choro, cuban and folk music and many other styles to perform original compositions with a unique sound.’ Compass are Tom Green (trombone), Alex Munk (guitar), Tom McCreadie (double bass) and Scott Chapman (Cajon / percussion). 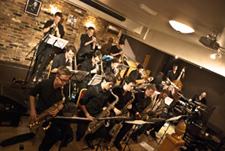 Tom and Jim Davison also run The Big Jazz Band, a project currently on hold, but looking to play again in 2015. 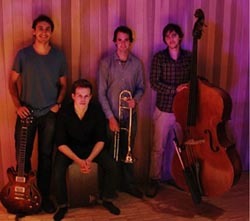 ‘The band plays my original compositions but also classics from the Swing era right through to the modern day – music by Fletcher Henderson, Thad Jones, Maria Schneider – often we find the earlier music is more challenging to play as less information is written on the page and you have to know the music and the style really well. The challenge is part of the reason to play it.’ The Big Jazz Band gig in Italy was followed by a gig in Tunisia with an expanded version of the Tom Green Septet. Click here for a video of The Big Jazz Band playing Maria Schneider’s Choro Dancado in Ischia in August 2013. In 2014, Tom was among the winners of the Help Musicians UK Emerging Excellence Award. Tom told us that he would be using the award to take his Septet into the recording studio. Tom says: 'We are recording our debut CD at the end of April at Real World Studios. Look out for the release and tour dates towards the end of the year'. In January 2015, Tom was included in the Take Five initiative. The project, organised by the organisation Serious initiative is aimed at British and UK based composer-performers and is designed to give some of the UK’s most talented emerging creative jazz musicians the opportunity to take ‘time out’ to develop their craft, build their careers and get their music out into the world. 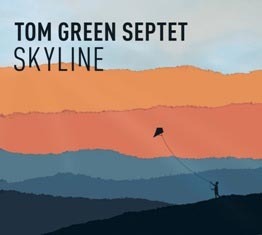 This coincided with the release in February 2015 of Skyline, an impressive album from the Tom Green Septet and a UK tour. Here comes an album I have been waiting to hear and it doesn't disappoint. You can hear a great band play live and sometimes it might not transfer to an album recording, but Tom Green's Septet has nailed it. 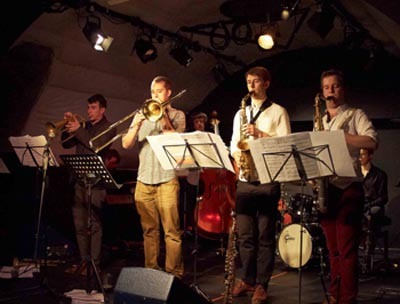 The Septet is: Tom Green (trombone), Sam Miles (tenor saxophone), Sam James (piano), Scott Chapman (drums), Matthew Herd (alto and soprano saxophones), James Davison (trumpet and flugelhorn) and Misha Mullov-Abbado (double bass). Tom Green was the first trombonist to be admitted to post-graduate study at the Royal Academy of Music. He won the 2013 Dankworth prize for Jazz Composition, and Dame Cleo Laine has said of his work: 'Some of the most exciting original new music I have heard for a long time'. His music has been described as 'inspired by writers for large ensemble, thinking in long arcs, and in harmonies which are rich and full. The Septet in his sound world is not so much scaled up small group as scaled down big band, tight, unified ...'. In the past two years the Septet has toured the UK consistently gathering acclaim and followers and has performed at festivals in Switzerland, Italy and Tunisia. Tom says: 'I have always been fascinated by light, colour, balance and harmony, both in nature and in music. On Skyline, many of the tracks are inspired by the interaction between natural landscapes and light in some way (Winter Halo, Mirage, Arctic Sun). I have attempted to use improvisation as a compositional tool to help tell the story of each tune, rather than using traditional head-solo-head structures. The huge advantage of composing for jazz musicians is that you can use improvisation as a means to take the compositions to a different place, but while still leaving each individual musician to decide the arc of a solo and how they reach that place in the composition. The range of colours and textures I can get out of those four horns is very exciting to work with as a composer, because I have at my disposal the core instruments found in a large ensemble'. Click here for a video with Tom introducing the band and the album. The result, of course, will depend not just on the quality of the compositions and arrangements but also on the standard of the musicians and in the Tom Green Septet, the standard is high. As for the compositions, they are accessible, engaging and imaginative. Tom says: 'I value melody above all else .. so I really hope all the melodies are memorable ...' They are. Click here for a video of them playing Equilibrium live back in 2012. The beautiful composition Equilibrium is the second track on the album which begins with Sticks And Stones, a good introduction as it illustrates the level of music you can expect for the rest of the album. The recording balance is spot-on and trumpeter James Davison and Scott Chapman on drums give us joyful solos. Listen out for another fine trumpet solo from James Davison on Equilibrium. Arctic Sun starts out with drums and bass setting the temperature, the piano easing its way in, and then the horns come along to grow the piece into what could so easily sound like a big band before Tom solos and the two saxophones interweave. Peace Of Mind is gently introduced by piano and trombone and expands with the band joining in until the piano and trombone take over again. Click here to listen to Sticks and Stones. Mirage again begins with trombone and piano, and trombone and saxophone solos stand out in an arrangement that is holding its hand up asking to become a standard. The well-established standard Skylark appears at track six. I have heard the band play this arrangement in live performances and I'm glad it has been included on the album. The saxophone picks up the melody and James Davison takes it forward with a great solo before Sam James treats us to an equally fine piano solo. Winter Halo comes in with Matthew Herd's wistful soprano sax, followed by trombone and gentle sax from Sam Miles. The album ends with D.I.Y., inspired partly by a friend of Tom's who almost electrocuted himself changing a light bulb and partly by the sounds of New Orleans second line parades. 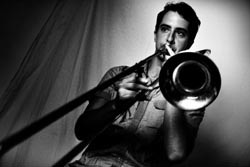 Tom Green's trombone brings substance as well as classy solos and it is Tom's arrangements and the way he writes for the four-horn section that brings that big band feeling. It is always easy to leave out credits for the rhythm section, but Scott Chapman and Misha Mullov-Abbado deserve recognition for the way they pull together the arrangements - listen to Misha's solo on Winter Halo and Scott's playing on Sticks and Stones. If I wore a hat I would also take it off to Alex Killpartrick for the way he has recorded and mixed this album. By now you will have gathered that I like this recording. It may be early in the year, but for me this has to be one of the most enjoyable, satisfying and outstanding albums of 2015. Click here for more about the album.